Home / Now where are those Spring Flowers??? Woo Hoo! Mellow Yellow is back from the finisher and they did a great job. It’s gorgeous! Don’t you just love the handles? Hot pink leather, an orange lining and beautious beaded handles. Now where are my Spring Flowers so that I can carry it? Guess I’m going to have to wait a few months, but until then it certainly is pretty. Gorgeous! Too pretty to carry (almost). Better schedule a garden party next June, Ruth. garden party – June… just in time for my birthday. Shall I wear a dress with a big swirly skirt? Oh, Holey Schmoley…I fainted dead away when I saw this! How lovely! 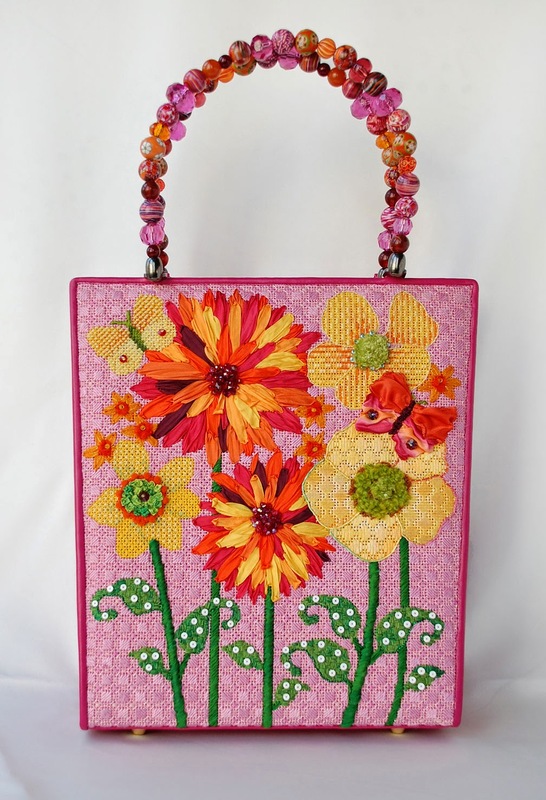 I can't figure out which I like more…the canvas and its embellishments or the finishing! How did you ever get that good? What a treat for the rest of us to see. BEAUTIFUL!! We have snow here and below zero temps (way below normal) so I needed those spring flowers (even if they are the stitched kind)! !